Before you read any further, let me remind you that some of the links on this page are affiliate links, which means I may receive a small commission if you click through and make a purchase. I only post products that I have used and actually recommend. I’ve marked any affiliate text links with a * for easy identification. Kids learn naturally through play. Why play games with kids? Games are great for teaching facts and skills. Do you want your kids to learn how to identify letters, numbers, animals, shapes, etc? Are you wondering how much your kids know about a topic, or do you want to teach them more? Need to practice counting, reading, fine motor, or even critical thinking skills? Finding games to play with toddlers is a great way to connect with them. A huge part of discipleship parenting is forming and maintaining a strong bond with our kids. They long for us to play with them, and, let’s face it: sometimes we adults don’t engage well in imaginary play. Playing easy table games with our children helps to bridge the gap between what’s fun for kids and what’s fun for us as parents. Playing with my kids is what I consider a foundational family discipleship activity. It’s not overtly discipleship like, say, family worship or community service, but if we don’t take the time to connect with our kids to just have fun, they aren’t going to be as receptive to anything else we have to teach them. So, we need to speak their language (play). Sit down at the table (or on the floor! ), and spend some quality time having fun as a family. This is Christian fellowship, guys. We can feel good about it! 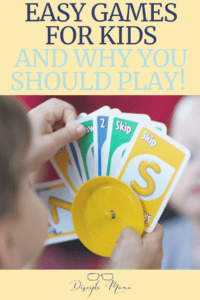 When we play games with our kids they learn how to take turns, which is a great lesson in patience (and an awesome way to teach toddlers to share). The earlier you start, the earlier they’ll learn! In many games it’s easy to see cause and effect, so children learn how their actions affect other people. Developing empathy takes work with toddlers, and playing games is a good place to practice consideration of others. Gameplay also provides great opportunities for kids to see their parents model good sportsmanship and courteous actions, and immediately apply what they learn to their own behavior. Note: Be a good sport! If you’re a sore loser (or you quit when it looks like things aren’t going your way), fix that before you start playing with your kids: this is not the sort of thing you’ll want to pass on. What we show them is what they’ll imitate, so keep it together, people. It’s just a game! Especially with toddlers, there should be no emphasis on competition. Introducing competition between a child and his or her parents isn’t the best way to go at this early age, and toddlers often just don’t get it. Also, it’s tough for preschoolers to focus on multiple aspects of a game, and competition (thinking both defensively and offensively in strategy games, or benefiting from another player’s ‘failure’ in trivia games, etc.) can be very distracting and distressing to young children. Is it okay for someone to win? Yep. But it doesn’t need to be a big deal for the winner OR the other players. We’re laying the foundation for our kids to be humble winners and gracious “losers” here, so introducing the concept of losing as quite inconsequential is healthy. The real focus of playing games with toddlers should be on players making a persistent effort and having a great time playing. As preschoolers, kids are not too focused on winning yet, but as they get older, they will be. As a Christian parent, I want to do what I can to help my kids practice winning and losing and using both experiences to build character and confidence. Playing table games is a great alternative to screen time! 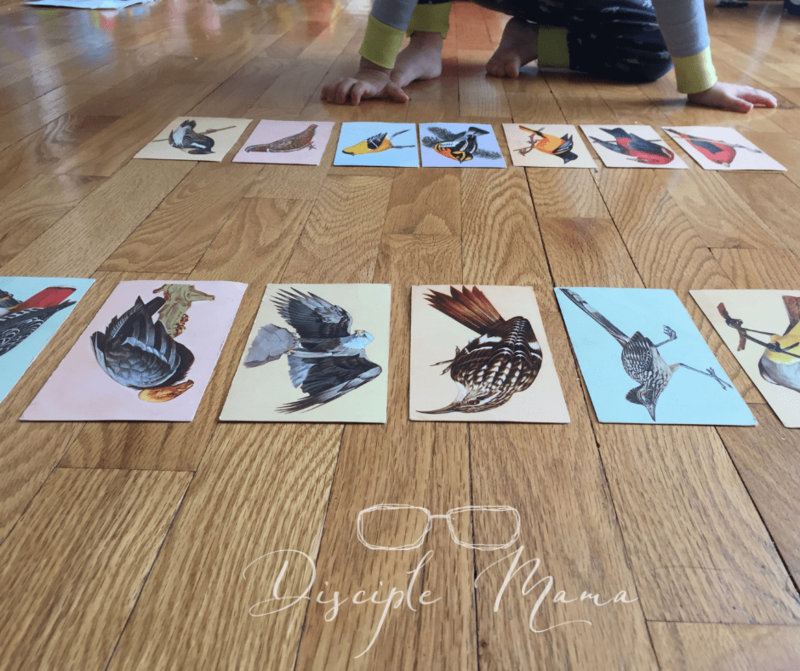 Find out why Disciple Mama’s kids are screen-free, and why you might want to try it, too! Memory and basic trivia games are great for exercising your brain and learning facts, but there are plenty of other educational and character building game choices out there. Keep in mind that some games are more customizable to varying ability levels than others, so think about whether or not all members of the family will be able to successfully (and happily) participate in whatever games you choose. The table games for kids that you probably think of first are games like Candyland and Chutes and Ladders. These games are wonderful, but if you’ve played Candyland lately, you’ve probably noticed that it just doesn’t appeal to you like it did when you were a kid. But, even if you aren’t excited by them, there is educational value to be found in playing these very simple games for toddlers. Candyland, Chutes and Ladders, Sorry!, Trouble, and even Life are all considered “roll and move” games. Of course, some of them involve more strategy than others, but for the most part, success is based largely on chance, which, though not particularly challenging, does offer kids the opportunity to win more often than many types of games. offers opportunities for them to practice counting. gives these kids practice with identifying colors (in the case of Candyland). evens the playing field because chance is a bigger factor than skill. One of the best types of games to play with preschoolers is matching, or memory, games. There are bajillions of these available in stores or online, and you can even make your own personalized memory games with index cards (or flashcards that comes in pairs). You can also use a simple puzzle set like this one: Melissa & Doug Alphabet Wooden Puzzles *. We gave this to E for his second birthday and he LOVES it. Fun fact: Ours came with two Ms and no X, but I called customer service and received the X in the mail about 2 days later, no questions asked. It turns out Melissa & Doug have fantastic customer service! You can find any number of memory games in stores and online, but our favorite (and the first matching game we ever played with E) is a vintage flashcard-type game called “Teach Me About Birds” from the 1960s. Unfortunately, I can’t give you a link to buy it (we bought ours at a yard sale), but all you need is a set of flashcards in which there are two of each card. We basically just play it like Go Fish (but with the cards laid out on the floor/table instead of hidden in our hands). Each player asks (politely!) for another person’s card (if it matches one of ours), and collect sets. If there aren’t any matches, we deal another card to each player. My son has learned to identify a large number of birds by playing this game, and he has fun doing it. This game can easily be adapted to work with any flashcards, as long as they come in sets of at least 2. Or, you could place the cards face down in a grid and play it like Memory, turning over two cards at a time, searching for matching sets. 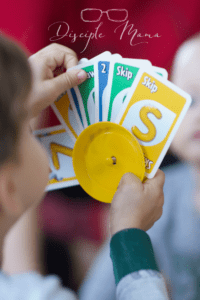 When you think of easy games to play with preschoolers, trivia games are probably not the first ones that pop into your brain. But, at our house we actually LOVE to play trivia games with our toddler. The secret, obviously, is finding a game with questions that your child knows/can learn the answers to. For us, that means Bible games! With our emphasis on discipleship parenting, we’ve been intentional about teaching E his Bible stories since he was born, and, it turns out, he’s learned quite a bit. We also have a decent collection of Bible games, and we’ve been playing some of them with our boy for months now (and he’s not even 3 yet)! Our favorite is, once again, a vintage game that we found in a thrift store. It’s called Egypt to Canaan, and the current version is available here, along with the Life of Christ and Life of Paul board games that we also own and enjoy (though we find the Life of Paul game questions to be much more difficult for our toddler). My husband and I both played Egypt to Canaan when we were kids, and it’s pretty fun to pull it out and play it as a family now! Of course, there are plenty of questions in the game that E can’t answer, but we have gone through all of the question cards and pulled out the ones that he should know. We simply keep them separate from the other cards with a rubber band, and we keep adding more questions to his pile as he becomes familiar with more Bible stories. Honestly, I don’t know of any research on the benefits of playing trivia games with toddlers, but I can tell you that it’s a fun and different way to drill facts. It helps him practice listening carefully to be able to correctly answer questions. Also, we ALL have a great time playing, because the game is tough enough to engage my husband and I, and easy enough (with the adjustment I mentioned) for E to be successful. Card games generally require a bit more strategy than the other types of games I’ve covered. In fact, I’ve been too intimidated by card games to try any with E (he’s almost 3 now), but there are some easy card games for young children out there. In fact, this morning, because I felt like I couldn’t write about card games with toddlers until I’d actually tried playing one with my kid, we played UNO for the first time. You guys, it was great! He managed quite nicely because he knows his colors, knows his letters, and knows most of his numbers. He got his 4s and 5s mixed up a couple of times, but other than that, it was a smashing success. And also, he won, fair and square. We congratulated him and he thanked us for playing with him. Important note: cards can be difficult for tiny hands to hold, so we put E’s cards in card holders like these . That made it easy for him to hold the cards (and he could put them down and pick them back up without any trouble, also). Enjoying this post? Subscribe to the Disciple Mama newsletter so you don’t miss anything! Put age-appropriate rules in place, and gently, but firmly, enforce the rules for all players. Make accommodations for kids of different ages and abilities–You don’t need to lay out the whole deck of matching cards for very young kids, and it’s okay to only ask children questions they have a fighting chance of answering correctly. Don’t let anyone win, and congratulate whomever does. It’s important for everyone to learn to lose gracefully, and that skill will not come naturally to kids if they always win without earning the victory. 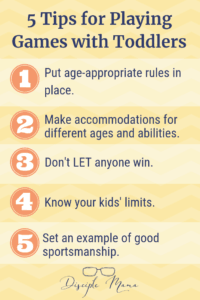 If you’re implementing tip #2 above, your kids will have a fair chance to win. Know your kids’ limits. Help them learn and practice game etiquette, but if they’re just too antsy to finish the game, call it and try again another time. There’s nothing fun about a game if the players don’t want to be playing it. 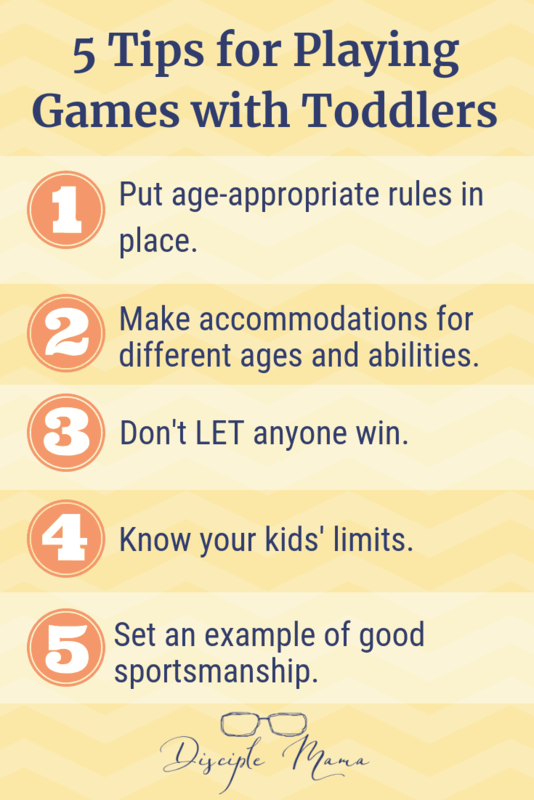 Set an example of the kind of sportsmanship you want your child to demonstrate. Character building is the most important goal of gameplay. Be courteous, play fair, and put more focus on effort and personal improvement than on winning. 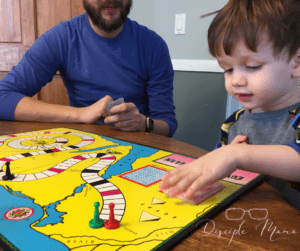 Playing games with a toddler may sound daunting, but it’s a great learning experience, and if you implement the 5 tips I’ve given you, it can be a lot of fun! Turn off the tv, put down your phones, table the tablets, and get some good old-fashioned quality time in as a family. Try a few different types of games, and it won’t take long to figure out what adjustments you need to make (or what skills you need to practice) to start learning and building character all while having a great time! If you try it, I’d love to hear about your favorite easy games for kids! Leave a comment below with your best toddler-friendly game suggestions! We love game night in our house! It’s the easiest way to show my only child about sharing, losing, sportsmanship, etc.. Great post! I’m glad you enjoyed the post! Yes, games provide so many teachable moments! I’m a huge fan of learning through having fun, and game night is perfect for that! With an only child, you’re right, that’s a fabulous way to practice interpersonal skills when it’s just the family at home. My husband and I were just talking about this the other days. 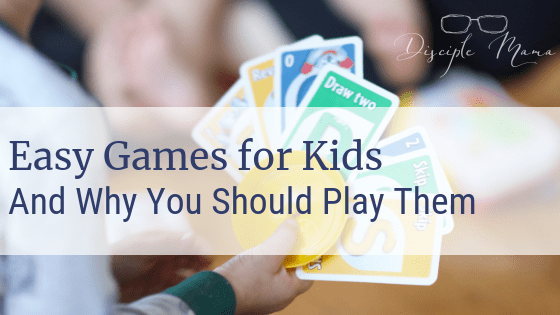 We have games like skipbo, Uno and little kid games too. We would rather teach our kids to connect with people on a rainy day then always have them on the screen. Plus it makes for a fun family game night too. Yes! I love anything that keeps them off the screens, learning, and having fun with people. Family game nights are pretty much the best, and if you start the tradition now, it can be lifelong! Thanks for all the great recommendations! Need to start a game night in my house. You’re so welcome! I hope you do start a game night! Let us know how it goes if you try it! Will have to share this with my husband—he would love to play more games! Share away! We love games because everyone can have fun, and it’s such great quality time! Great ideas! We need to do this more often. Unfortunately, the hubby isn’t much of a game fan but maybe A can be my game buddy instead! Aww, you need a game buddy! We’ll have to get together and have a game night (during the day) with the boys sometime! We love family games and try to collect them. It’s a great way to bond. That’s fantastic! We have a closet full of games at our house. I can’t want for my boys to be able to play even more of them! Family bonding doesn’t get much better than game night! I’m sure every family’s favorites will be different, but I’m sure you will find games that you all love to play together! I think just trying it for the first time is the hardest part. After you do it once, it’ll be easy! Winning and losing with grace is difficult to learn late in life, I think, so it’s much better to learn early! Ooh, yes! We’ve tried Dominoes with E, but not Mexican Train. That would be better! And we haven’t tried Jenga yet, but I’m sure he’d love it! Thanks for the fabulous ideas! Thank you for the great ideas! I can’t wait to get more games and start playing them with these kids. I like the looks of Egypt to Canaan. I’m sure we’re going to love it! Yes, it’s so much fun! Egypt to Canaan has been around for a long time, but they’ve updated it now and the new one looks great! Love your tips for playing!! You’ve also just given me some great ideas for Christmas presents. Thank you! Lisa, I’m so glad you were inspired! I am sure that whoever is on your list will love the games they receive (and, even more, the quality time with their loved ones as they play)! Thanks for visiting my blog! I teach, and have always though that a child’s first work is play. my littles love to play and read together, but the smallest is still a bit young for rule based games. The importance of play really cannot be overstated! Thanks for visiting my blog, Carlise! Please come again soon! I love all of your ideas and I am enjoying reading your posts. Even though I am past the toddler age with my girls, I still have lots of friends with young kids and will be recommending your posts. UNO and memory were some of my favorites and were easy for my girls to learn when they were little. There is also a snail race game, don’t recall the name, but it was super easy for little ones and big kids got into it too. But now one of my favorite things to do is to take my oldest (12 years) to a coffee house and we take a game with us (usually Dutch Blitz). It is such a great bonding time! I love Dutch Blitz! Keeping a game or two in the car or even in your purse is such a great idea for when you have a few minutes before food arrives at your table, etc. I’m so glad to hear that you’re making special time to spend with your daughter. She must love it! I’ll have to look into the snail game for my little ones! Thanks for visiting my blog again, Luisa! Games offer so much in the way of conversation starters, too. Many good conversations have started over a rule or something that came up in the game. Ooh, Beth, that’s a good point! We’ve had great conversations in our home over rules, special circumstance, etc. Thanks for sharing that thought! Please come back and visit the blog again soon! Yes, having grown up in a games playing house and having enjoyed playing games with my own children I now am privileged to be playing games with my grandchildren, from simple made up games there on the spot to more formal board and card games. Its a great way to interact. Though I am always surprised how quickly each of my grandchildren have cottoned on to my ‘Hide, NO Seek’ game! Tony, it’s wonderful to hear that you’ve been playing games with your grandchildren! I have wonderful memories of playing games with my grandparents (and I still play games with my grandmother whenever I get a chance)! Thanks for visiting my blog, come again soon! I miss a game night. Our kids are grown and no longer close by. Our daughter still lives with us but I’ll admit that we’ve gotten away from this type of activity, I think mostly because it’s so challenging for me as an amputee with no hands. But you’ve given mé some ideas to revive game playing. Thank you. It’s difficult sometimes, to keep the game nights going, especially in different phases of life, and I’m sure that your situation as an amputee makes many games quite challenging! But there are many types of games that you could play with a bit of help from your family, like trivia/guessing type games. I actually love those types of games, and there are a lot of fun ones out there! Let me know if you’d like any suggestions. I’d be happy to help! Great tips and ideas in this post! We all need to bring back more game time, less technology time. I love playing card games with my teenagers! One of the greatest benefits is how games connect the generations in our family – we have countless memories of cards, pictionary, spoons – over the years during family celebrations that we will cherish all our lives. Yes! Playing games together creates so many wonderful memories! I have them, too, with my extended family! It’s such a great alternative to screen time, too, because the opportunities for connection are so much greater when we put our devices down and engage each other personally. Thank you for visiting my blog again, Jamie! Come again soon! You listed some great reasons why we ought to play board games with our children. Hello Edna! I have a hard time choosing a favorite board game, actually! One of my favorites is Sorry, which isn’t too intellectual, but it is fun! I also like a board game called Pente, which I’ve had since I was a little girl. Thank you so much for visiting my blog again, and for sharing your favorite game! Sure, I love Sorry – it’s a fun game to play!